The Trump administration on Thursday announced it will create a series of new pay systems to reward certain groups of employees, using existing authority that the federal government has never before deployed. 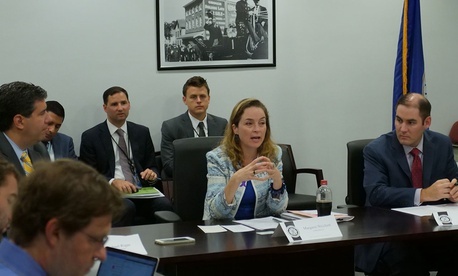 Margaret Weichert, the acting director of the Office of Personnel Management who took charge of the agency after the White House forced Jeff Pon to resign last week, announced the new initiative as part of a package of steps she is implementing in her new role to boost recruitment and retention efforts. OPM is also planning to provide governmentwide expedited hiring authority for information technology positions, as well as those in science, technology, engineering and mathematics. The changes are just the beginning of Weichert’s agenda, as she promised to unveil a series of reforms in the coming months. Weichert is serving as OPM’s acting director while remaining in her existing position as the Office of Management and Budget’s deputy director for management. OPM is planning “a number of administrative guidance and legislative changes, as well as ways to work and learn from the private sector through public-private partnerships to get people into government to focus on the things the American people need,” Weichert said. She added that existing civil service laws are “well-intentioned,” but “layers and years of statute and added regulation have made it very complex and very cumbersome to operate nimbly and agilely in the 21st century.” The changes, she said, would improve enforcement of the federal government’s merit system principles. The special occupational pay authority was created by lawmakers in the 1990 Federal Employees Pay Comparability Act, which was included in a spending bill that year, but OPM said it has never been used. The law states the President’s Pay Agent, made up of the secretary of the Labor Department and the directors of the OPM and OMB, can establish an alternative pay system for job categories in which the normal standards “do not function adequately.” The Pay Agent must post a proposal in the Federal Register, submit the suggestion to Congress, hold a public hearing and consult with affected agencies and unions. The base pay under the alternative system is capped at Executive Schedule level five, which is $153,800 for 2018, but the law does not prohibit locality pay on top of that. OPM will issue its first alternative pay system for economists in the federal government. The agency called it a “high-risk, mission-critical” occupation in need of a “new approach” for pay. OPM has formed an interagency working group to identify additional occupations for a new pay and classification system, and expects to create proposals for three-to-five additional jobs over the next year. While the pay reforms will focus on attracting “the right highly specialized, highly educated individuals,” Trump has proposed a pay freeze on a governmentwide basis. Congress is eyeing a 1.9 percent increase to override Trump’s proposal, and Weichert noted that ultimately “appropriators will do their job and make appropriations decisions they believe are relevant.” She touted the administration’s proposal to create a $1 billion fund to reward the government’s best workers, however, and said federal employees are not in it for the pay. The STEM and IT direct hire authorities were initially launched under the recently ousted Pon, who was forced to resign after clashing with the administration over its vision for the future of OPM. OPM “is aware that individuals with the knowledge, skills and ability to perform in science, technology, engineering and mathematics (STEM) and cybersecurity occupations are in heavy demand and that this demand could, perhaps, be affecting mission critical functions,” Pon wrote in a memorandum earlier this year, in which he announced he was “exploring” the possibility of issuing the governmentwide authorities. The STEM authority will apply to jobs involving engineering; economics; biological sciences; physical science; and math, statistics and actuarial sciences. The IT authority will apply to positions involving cyber security and operations; computer network operations; information assurance; and diplomacy, military and intelligence missions related to information and communication infrastructure. The STEM authority will be finalized in regulations next week, while the IT authority will require a combination of regulations and power already provided to Weichert. Terry Gerton, president of the National Academy of Public Administration, praised the reforms, calling them "important steps forward" in modernizing the federal workforce. "Given the urgent need for government to adapt to the rapidly changing nature of work, OPM’s actions are a positive step in the right direction," Gerton said. Weichert said OPM is moving forward on its reorganization plan, and has already taken steps on the administration's proposal to consolidate background checks within the Defense Department and to move many of OPM's transactional functions to the General Services Administration. She pledged to push forward the plan to fold what remains of OPM into the Executive Office of the President in the White House, a key point of tension between the administration and Pon.